Hello everyone. I'm looking for the rear emblem that says "ALL WHEEL DRIVE" that is attached to the rear liftgate. It's located just below the XP8 emblem. I've seen some XP8s that have it and some don't. I was told they were decals at first, then someone created a plastic mold emblem thereafter. I did a search online and found someone that was selling them a few years back but I can't get a hold of him. Does anyone know where I could get one? I've found (and acquired) a couple of the XP8 badges. There is a guy on eBay that sells them often. Mine has decals like the pic but I've never seen the decals reproduced or the "All Wheel Drive" badges. Seems like a place that did decals could reproduce them pretty easily. Vintage Auto Literature sells a lot of those type badges on eBay. Might send him a message and ask. Yeah, Lee, I think that's the guy I got my badges from.. didn't think to see if he had the other ones.. Thanks guys! I'll see if Vintage Auto Literature might have one. I highly doubt it because I haven't seen one in a very long time. I can have a graphics shop make one for me but I would prefer to have an authentic one. Are the original decals in chrome or is it a silver border/lettering? Chrome foil decal stock with black and red printing on top. I have seen them in the past. I have one but it needs some TLC, all the "chrome" is faded or flaked off but I believe it is original. Let me know if you are interested, I will see if I can find it. It came in the glove box of an XP somewhere in my past. I bought a bunch of decals from a guy out of Canada if I remember right. I don't recall needing an All Wheel Drive decal but he did have the Saleen Explorer and the XP8 lift gate decals. He is he only one I recall having those. I think I may have a silver set but pretty sure no All Wheel Drive decal. Thank you sir. I'll see if I can replicate that decal somehow. If you have one, that would be great! Maybe I can have the border and lettering painted since the chrome is peeling. If not, I can try my best to replicate the decal somehow. 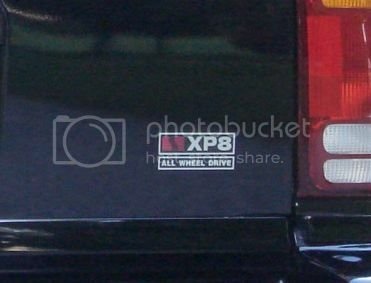 I have a pair each of the XP8 and All Wheel Drive in badge form. I wonder if there is a way to replicate those also. I have a '98 which just had the simple "XP8" decal so I didn't put these on the truck themselves. I'm sure there is a way to replicate with a mold but it could be costly. I think it might be best to have a graphics shop make one for me. Someone from another forum was selling a handful of molded emblems and decals 6yrs ago. It's doubtful he has any left. There is an online company that makes them but to purchase, the minimum quantity on emblems is 250pc. I checked and I do not have one. I have one of the SUPERCHARGED ones but not the ALL WHEEL DRIVE one. Sorry! Not a problem. I appreciate you checking into it for me. I'll keep my eye out for one of those and hope that maybe one might show up for sale some day.